The Program Seminar serves to foster scholarly community among the faculty, students, and visiting fellows of the Program. We meet weekly to think and talk together, and this is a considerable pleasure (not to mention intellectually invigorating). Topics of the gathering vary. Often we discuss a pre-circulated work-in-progress, but other conversations are welcome, including recent literature, events and trends in the profession, issues of common concern in the Program. The goal is to bridge the divisions and to counteract the centrifugal forces that tend to affect small programs with broad scope. 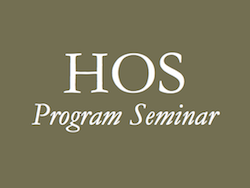 View a list of past Program Seminar topics.